Some great Google search tips from Nicholas Rossis. When I participated in blogging 101 last fall, one of the assignments was to introduce a new feature to your blog. I was thinking about that back then, but didn’t follow up, until I reread the assignment because it happens to be the assignment of the current blogging 101 event today. And what do you know? I’ve done that now by giving myself a schedule and challenge myself to at least three posts per week. I’m reading many blogs (and that reminds me that I should add making a good blog roll page to my to-do list) and often find interesting posts I would like to find again, and also share with you, dear readers. I think I’ll collect these posts under the ‘Blog Traveller’ tag, maybe sort them according to my themes, maybe not… but it will be a regular feature, and get its own tag. When I’m on facebook or g+, I sometimes share posts with myself that I find particularly useful and don’t want to lose. I have mostly MOOC and writerly friends there, and don’t want to spam them with posts about dog training, or space images, or whatever else tickles my fancy. I tried to do this with a blog post here, too, a while ago, but found that this doesn’t work. While I don’t regret it in this particular case (it was about reactive dogs), and understand that reblogging sometimes is a compliment, I don’t want to overdo it and “steal” other people’s content. Some simply don’t like it. I think making lists and linking to these posts will highlight the posts, lead interested readers there, and help me finding these posts again. This post today contains two blogging101 challenges because I’m lazy and only did yesterday’s assignment today. Yesterday’s assignment: add a new page to your blog, and make sure readers can find it easily. I added a To-Do list because I don’t have time for anything fancy right now. You can find it under the About page. Today’s assignment: pick a blogging event from the Community Event Listings to try for some instant community. Phew. I did that. With facebook and g+. I don’t want to get into twitter, I really don’t. I think facebook and g+ are just enough exposure from me. 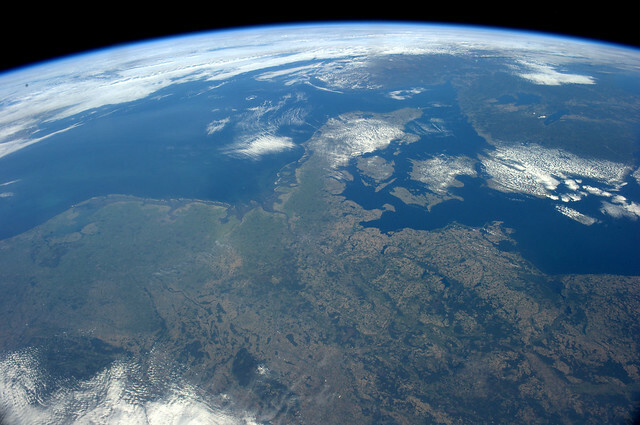 And to prove it: linking to a lovely picture from my country our local astronaut Alexander Gerst posted on g+ and fb on our public holiday on Friday. It was a beautiful, sunny day. All these pictures are on his photostream on flickr, to which this image is linked. And, if anyone looks at this blog because of the assignment, let me give you a pretty post as welcome. Again, I have to skip, because I did that when I started this blog. I love trying out themes and playing around with the options the different layouts offer. I played with the themes again when I did the branding exercise for Creativity, Innovation and Change. And so, today, I shall chat about why I chose the theme I use, and what will take up much of my time over the next few weeks. Because something happened which may be insignificant to you, but is very uplifting and encouraging to me. Yesterday’s post about Bloglovin sang its praise, and I still say that it is a pleasant and easy to use tool. I won’t use it, though. Most of the blogs I’m following, especially the news sites, aren’t updated in time on Bloglovin. I’m getting posts from September 9 and 10, and nothing new. Some other feeds have newer posts, but not from today. Friends from WordPress I’ve added there aren’t updated either, all I get to see are older posts. The only ones that seem to be up to date seem to be those that are registered on Bloglovin. I am deliberately vague because I won’t spend any more time on finding out exactly what is going on there. It certainly is a good place to make your blog known to the Bloglovin community and find other blogs that are there. As an independent newsreader: not so great. Finally, something I forgot to mention yesterday: if you use AdBlock or some other ad blocking tool, turn it off for the sites you want to support. When you block their ads, they won’t get the money for your visit. In Adblock this is done quickly and easily by clicking on the icon and telling it to deactivate for this particular site. This is for firefox, I’m not sure if there is something similar for Internet Explorer or Chrome. Firefox is still the safest browser, Internet Explorer is still full of security issues and Chrome is fast but wants to grab you, everything from you, all your data, all your activities–it’s acting out what Google has become. Too sad, Google was such a great project in the beginning. But I digress. Today’s assignment is: follow five new topics in the Reader and five new blogs. This refers to the WordPress reader, where you can read other people’s blogs, search for interesting sites and look for interesting tags.I have done that already, I know my way around the topics and I’m already following several new blogs and met several interesting new people. So I’ll skip this assignment, too. Instead, I am posting the long overdue follow-up on feed readers. A while ago, I wrote about Bloglovin and Feedly, mostly because I wanted to activate my Bloglovin account to try it out, I had read about it elsewhere. Then Bloglovin and Tumblr had a disagreement. Tumblr is a blogging site where many artists post their art, many of them relying on page hits and ads for their income. Furthermore, free providers like Tumblr apparently get part of their profit through the amount of traffic to their sites (and probably their ads) — but I don’t really understand this part of the provider/content generator game fully. In any case, Tumblr didn’t like that Bloglovin got all the traffic, and Tumblr got none, so they blocked Blocklovin. I wanted to find out more before I wrote this post, hence the delay. Since yesterday, they are friends again. Apparently, the sites both get traffic now.